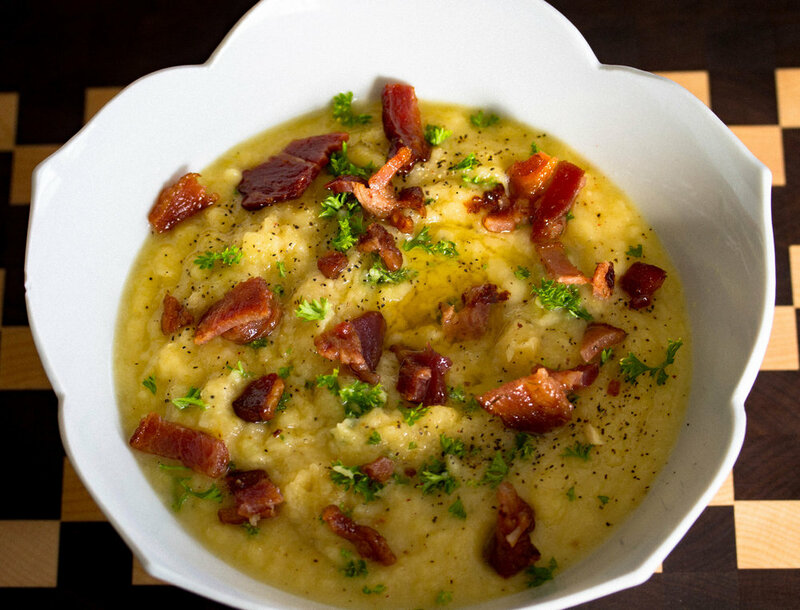 This is my take on the classic potato leek soup but made with my favorite..rutabagas. Rutabagas are a mix between a turnip and a cabbage and are an excellent source of vitamin C, so this nourishing soup is perfect for the colder months to help boost the immune system. Rutabagas are also a good source of potassium, manganese, fiber, calcium, magnesium, phosphorus, and vitamin B6. Check out a few of my other recipes like Rutabaga Fries or Mashed Rutabaga and Cauliflower for more ideas on ways to cook with rutabagas! In a dutch oven, melt ghee and add leeks. Saute until leeks become soft and then add the rutabagas. Season with salt and pepper and cook for about 5 minutes, stirring occasionally. Add the broth (it should fill to about 2.5 inches from top of pot) and bring to a boil. Reduce to simmer and cook until rutabagas soften. Once rutabagas are soft (about 45 minutes), remove from stove and allow to cool. Once cooled, blend with an immersion blender until smooth. Garnish with chopped bacon and parsley.